The Source sought to promote players’ development of twenty-first century skills (See Education for Life and Work: Developing Transferable Knowledge and Skills in the 21st Century). The program primarily focused on influencing players’ (1) intellectual openness, (2) problem solving skills, and (3) teamwork skills. Based on interview data, it is evident that the program greatly impacted players’ approach to problem solving and orientation to teamwork. Interviews revealed that the majority of the activities provided players with the opportunity to learn how to exercise critical thinking skills. Players noted that activities were challenging and required them to think in alternative ways. Moreover, players noted how these skills could be applied to their lives outside of The Source . The program was also successful in providing opportunities to engage players in cooperative work. Players discussed the importance of teamwork in overcoming challenges and their success in competing with other teams as part of “The Game.” The majority of the players interviewed expressed learning the benefits of listening to other perspectives and how to compromise through the program activities. Players also expressed learning about the benefits of teamwork and desiring to work more in teams after participating in The Source . Players also appreciated the diversity of ages within each team and the support of their mentors. The program was successful in influencing players’ twenty-first century skills. Since many players were drawn to The Source due to their intrinsic curiosity, players noted that they were already curious individuals before starting the program, so there was little room for growth in this area. Several players noted that the field trips and scavenger hunts outside of the building seemed to influence their openness. Players also expressed the desire for more activities outside of the building. Critical Thinking: Players felt The Source improved their critical thinking and problem solving skills. The majority of players interviewed felt that they were provided with intellectually challenging activities that facilitated their ability to solve problems. The problem solving… I like to figure out problems. But then if I can't figure it out, I like probably would get irritated. But it still makes me want to try harder and stop to figure it out, so that's kind of fun to me. I like how everything we did was basically critical thinking, every activity. Doing the cards activity, figuring out who has your card by eliminating everybody from circumstances of how – everything you do is critical thinking. We actually do a lot of code breaking and stuff like that. We have to look at, solve a lot of problems that'll make you think more about the world and stuff. Several players discussed how the activities helped them learn to think critically and strategize. The program provided players with opportunities to examine problems from multiple perspectives, develop alternative ways of thinking, and consider the perspectives of their teammates. It made me think a little more outside of the box. A lot of the stuff that we did required not just thinking about it in a certain way, but you had to think about it from different perspectives. You had to actually think about your plan and your strategy. You can't just say, ‘Okay, I'm going to put it here and I'm going to see what happens.’ You actually have to think because somebody could take your piece and gain your power, or you could just become obliterated completely. So you actually have to critically think. Critically think about what you're supposed to do so you can stay in the game. It has me thinking more than anything because I can't really focus on one thing because most things have more than one component to it. I have to think about all of the possibilities instead of just deciding on one possibility that I think. I would take the easy route of approaching problems, but now I kind of take the hard route too – to just try new things and get better at it. Trying to come up with a plan of what everyone -- everybody's strong suits and their weaknesses, and we try to play them out and we try to use them for their benefit. Moreover, players were able to gain insight into how the problem solving strategies could be applied to their daily lives and how what they learned in The Source can benefit them in the future. It's helped me as an overall person. I learned more, and the note taking that we did -- oh yeah, I mentioned my favorite game Mafia. It's like the note taking that we did. And also in that game, you could lie about stuff. So I tried to separate the lies from the truth, and I enhanced my note-taking skills. I feel that that was good. If I was to go back to school and learn math, I would probably be able to figure out different ways of doing problems now, after this. But before that, I would figure out one way to do it, and that's the way I was taught. So that's kind of how it got me thinking. It made us think how we can use resources more efficiently, so we're not wasting all this energy by doing nothing. Working with Others: The Source influenced players’ perception of teamwork, ability to cooperate, and respect for others’ opinions. The Source helped players who typically prefer to work alone recognize the benefits of collaboration and teamwork. As one player noted, “I like working by myself a lot when I'm at school because I don't have any distractions or anything, but now it's good to get help from others when you don't know what to do. I like communicating with other people and things like that.” The Source also helped players learn to value the different strengths others have and how to use these to collaborate and problem solve. In short, players learned that two or 10 heads are better than one. The main skill that helped us all out was teamwork. Everybody has their own little skill or something about them that works, and to all the games, the scavenger hunts that we made, everyone has their own skill that will work in those fields. But when we all used our teamwork, we were able to put it together so we were able to solve some of the mysteries from some of the games we play. The Source allowed players to learn about the benefits of considering other people’s opinions and how to compromise. I thought [ The Source ] taught me how to work together as a team because we're all in our groups and sometimes we disagree, but we had to find mutual solution to succeed in the program. I learned to just let people who kind of sort of say what they want and like, you have to kind of think about your opinion--maybe you're wrong, maybe you're right, and you can actually play off both. Theirs and yours find the perfect answer. Working with people that you didn't choose to work with forces you to have to consider other people's opinions and having to accept that you might not have the best choice or approach to a certain problem, so you have to come together and try to explain why you think you should do that. In that process, trying to explain, you see the good sides and bad sides of your solution. The teamwork component of The Source made all activities more engaging. Some of the activities are fun and then some I didn't really care for, but at the end of the day it was all about collaboration and helping with the group and learning to get to know your group. I thought it was going to be like school in a way, just more with technology and everything, but then after the first week, I got the hang of things, and it's still hard, the thinking, in that you have to rely on others and it's not just individual type of project, but it's fun because you get to meet new people and you get to think differently than what you would any other day. I guess it's not just the games itself, but the team dynamic along with the games. If you have a good team dynamic then it kind of enriches everything. Intellectual Curiosity: The Source influenced some players’ intellectual openness and the program attracted players who were already curious. Several players noted that The Source influenced their curiosity. It's been pretty cool, I mean I like it. It's interesting. It like gives you a look on things that's totally different from what you're used to. Playing The Source … It's boosting my curiosity level. I don’t trust things as often as I do now without having a curious judgment about them and getting the truth about things. I don't like to be false. I don't like false stuff, so my curiosity level goes up until I find out what's true. The code breaking, because I had never done that before. So it was just kind of like, ‘What is this?’ I didn't really understand it, but when I really did it, I learned something new. So that would be helpful in my near future. I liked the code breaking. We get really hard stuff, and you have to – mostly, it's a lot of codes that we have to break and stuff. So I try to take the easy route, I kind of get – it's just over quickly. And when you take the hard route, it really makes you think more. It makes me really curious about it. I've become more curious about technology, especially about robotics. The man showed us how simple it is to create a small, practical robot out of some cheap parts, and I feel that this could be something that I could learn at home. I think it helped my curiosity a lot because I used to be the person in class who didn't ask much questions if I didn't understand it. I would go home and try and look it up, but if I didn't get it I just didn't get it because I wasn't comfortable with asking questions. But I think The Source helped me open up, and if I didn't understand something, then you ask a question in there so you didn't have to worry about it later on. And you know what you're doing. I was always a curious person. I always got in trouble for being curious and poking my nose into things. Now I'm probably going to be a lot more curious, because now I can use a scientific aspect. So instead of looking into it, I can be like, ‘I wonder what it would do if I do this or I did that.’ And I get into even more trouble. Although many players felt that exposure to new experiences in The Source sparked their curiosity, several others noted that the program did not impact them in this way because they were already curious before entering the program. I’m just as curious [as before]. I’ve always been a curious person, but playing The Source just got me more into it. In a way it got me talking more and communicating more with the things I’m curious about. 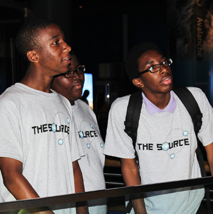 One of The Source’s objectives was to influence players’ interest in STEM and increase STEM content knowledge. Based on player interviews, the outcomes for this goal varied depending upon each player’s prior STEM disposition and STEM exposure. Players generally fell into two categories prior to participating: 1) those who were attracted to The Source due to their interest in one or more STEM fields or 2) those who knew nothing or little about STEM before beginning the program. For the players participating in The Source who began the experience with already developed positive dispositions towards STEM, findings show that their interest in STEM fields did not increase. This is not surprising since they were already highly interested in STEM fields before participating in the program. Similarly, these players already had a basic understanding of the content across STEM fields, so they noted that they did not learn a great deal because the STEM material was mostly “review.” For these players, the program reinforced what they already knew about STEM and provided them with resources, such as online activities and interactions with STEM professionals, to build upon their knowledge. Moreover, some of these players felt that The Source could have taught them even more, especially in regard to technology and game design. On the other hand, many players were not familiar with STEM before entering the program. Several players in this group expressed that The Source positively influenced their attitudes toward particular STEM fields (e.g., science or mathematics). Furthermore, these players learned more about the application of STEM to their daily lives and future STEM careers. There were also players who did not see any connection between the program’s activities and STEM. Although STEM could be related to most of the activities that make up The Source , the term “STEM” was rarely used. During the initial orientation, players were explicitly exposed to the word STEM; however, if they were not present at the orientation, they missed this important conversation and therefore lacked the STEM lens through which to view the activities. These players didn’t know the meaning of “STEM” and revealed that there was little or no discussion regarding how the daily activities were explicitly related to STEM. Mentors noted that there was indeed time allotted to discuss activities, but there was no direction provided for which topics should be covered or how that time should be spent discussing them. In general, players learned more about twenty-first century skills than content knowledge in STEM areas. STEM Attitudes: Players’ STEM attitudes varied depending upon prior exposure to STEM. Several players felt that participating in The Source influenced how they felt about STEM fields. Before I came here I thought it was going to be really boring because I was like ‘STEM, math, ew.’ But I was kind of impressed with what they were doing because I did have fun while I was here. It's just like – I don't know, I had fun, but then some – with like the STEM, the house of cards that we did, I feel like that was STEM. Like engineering, and you have to think of how to build it and have cards not falling down, stuff like that. I thought that was pretty STEM-related. It made me like math more because I used to hate math. I was a reader. I liked to read more than anything. After this, I kind of want to get more into math now. It has shown me another side to math that I've never known about. I think that this was a brilliantly thought-out idea. Yeah, this was a really nice idea. Even though I'm not really a science, technology, engineering, math person, it kind of got me interested in it. Although many were engaged, some players’ interest in STEM was not affected because they were already highly engaged when they entered the program. I can't get any more interested. I’ve worked with technology my whole life. My dad was in IT, and I sort of want to do that when I get older. I came in interested, and I’m still interested. I wouldn't say it hasn't changed anything about math because math I’ve always liked. And for science, it kind of made me look at it more seriously. It made me take another look at the science portion. Some players who entered the program with low STEM dispositions were never engaged and were withdrawn from activities. Not interested. It doesn't spark any interest in me. It's probably like the reason why I was really wandering around. I was just bored. STEM Exposure: The Source exposed players to STEM fields. The Source broadened players’ understanding of STEM. 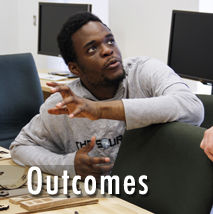 Players learned that STEM had a broader scope and encompassed more fields than they previously thought. I learned the ways [STEM] can branch out. It can branch out into things like encryption, code encryption, stuff like that. I guess when we had a guest speaker come and he explained how the I-Pass works, like when you’re on the toll way. He explained how that worked, and most of us just thought we knew it was a camera or a barcode scanner, but the way he explained it, it was different than we thought. I [had] never looked at science that closely, but I guess we did stuff with the STIs, and stuff like that, made me look at the overall importance of science. [ The Source ] made me just look at things around me more deeply. Like the whole energy crisis thing, like I know it's kind of America right now but I never really paid too much attention to the whole finding out how to build energy. I'm like, ‘Oh, it's more complicated than I thought.’ So I decided I might want to look into that a little bit more, and then the whole spread of disease thing, that's pretty serious too. I never really paid too much attention to those things, but I might pay a little more attention to them now. I didn’t know what an epidemiologist was, and I just learned how to say the word. I also learned about engineers and what they do. I guess I thought they were basically inventors, but they’re more interactive with everything than I thought. [STEM is] more in depth. I didn't think it stretched out this far. I really only thought it had to do with technology, engineering, math and science, but now I see it rolls into so many other things. STEM Content: Players’ STEM content learning varied depending upon their prior exposure to STEM. Through participating in The Source , some players felt they learned new STEM content. Then I learned a lot about technology, how you can build a robot from house materials. I learned code breaking for the first time! I think we've been exposed to the engineering part of STEM the most. Mostly because apparently Adia's father is an engineer, so we've kind of been – half of the games have to do with engineering and building something, some building to help stop something. Or a lot with science, because some of the games, especially for the virus week, we had to try to stop viruses from coming around, thinking of stuff like that. There is evidence that players who entered the program due to their prior interest or background in STEM did not learn much, since much of the content covered were things that they already knew. I think for me, personally, a lot of things that I learned, or they told me here, were kind of a review slightly, because I’m really interested in STEM and I came here to this program because I love it, and I already knew quite a bit about it. Considering that it was done in a new way and it's the first time and considering that they were trying to make it fun so that people wouldn't get bored, they did okay, but I didn't feel like I learned STEM skills. I thought there could've been more focus on the STEM stuff. I thought we would maybe learn more detail. It was really basic stuff. They would ask us a question at the end of the day, and I felt like I couldn't really answer that question because we didn't really focus on it enough. STEM Content: Mentors gained STEM content knowledge. Similar to players, mentors felt they learned STEM content through their participation. I definitely got interested in cryptology, so I would say so. The program definitely influenced my ideas and thought processes. It was very STEM-based. And I think that I learned a lot from it that I probably would never have learned outside of doing this program. There was a lot having to do with engineering and how to map a city to do it the most economic way and eco-friendly way, stuff like that, that I just hadn’t really thought about ahead of time. It definitely made the kids think about that and be like ‘Oh, this is why we have the L, and that’s why the transit system is the way it is.’ So I think that it was definitely focused on STEM throughout the program. STEM Careers: The Source influenced some players’ interest in STEM careers. Several players indicated that The Source influenced their interest in pursing STEM careers. I never knew that there were other jobs out there, that I learned from The Source . Like chemist, engineering, and I was like, ‘Oh!’ I mean, I knew about them, but I wasn't really interested. I was like, ‘Those are men’s jobs. I’m not trying to do that.’ But over here it's like, ‘Anybody can do that.’ I remember when we had professional visiting, and he was teaching us about how he made robots, and how it was mostly girls in the room, and how it was the guys who weren't caring and it was the girls who are interested. He was like, ‘Girls, if you're interested, you should come to the engineer fair because girls are really wanted.’ I never knew that. We had to think like an engineer because an engineer has to make sure the building's stable, be able to hold mass weight, and it made us think like that. I actually liked that it made me think engineer might be a career option for me. Before [ The Source ], I thought that STEM was just like a bunch of nerds getting together, but right when I tried it, I'm like, it's not all about that, it's about life skills, things to put forth in the future. I feel better about becoming an engineer, because this has helped me a little bit. It's also made my decisions stronger about colleges. People used to asked me, ‘Do you want a job in STEM?’ and I'm like, no, never. But now I'm actually looking into some of the jobs that are in STEM, because I see how they can make it into a game and make it actually fun. I started thinking about jobs in that area. [I am] a little more excited [about STEM] maybe because when we were learning about health and the spread of diseases, I think I want to work more in epidemiology, and maybe become a professor of virology. I feel like if we really helped these kids and talked to them about STEM activities that would actually make them interested and to want to participate in STEM activities in the future, STEM careers in the future, past high school and college. Some of these kids are in middle school, in eighth grade, going to freshman year, so they're not sure what they want to do with their lives yet. I feel like what we did would definitely help them think more about what they want to do in the future. Although The Source influenced several players’ ideas about future career aspirations, several players expressed that even after participating, they still have little or no interest in pursuing a STEM career. I feel like I won't take a job in [STEM]. It's too much work. 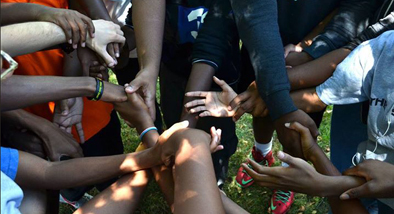 One of the most powerful outcomes of The Source was that the program facilitated strong relationships among participants. Every player and mentor interviewed highlighted the positive connections they formed through The Source . One mentor stated, “I think the best part was just – it was the kind of relationships that got built, just because it was so long. From the first week, people were still kind of tentative with each other, but by the end, really strong relationships just between the players themselves, but also the players and their mentors and even the mentors and each other, had all really developed. And that was really nice to see.” Findings reveal that the strongest connections were formed among players. Moreover, several players felt as though their mentors acted as siblings by both supporting them and relating to them. Mentors also felt strong connections to their players and appreciated the opportunity to support them. There were a few mentors who noted they did not have much experience working with youth prior to The Source . Due to their lack of experience, these mentors were, at times, challenged with managing player behavior. Overall, however, the program design and conditions allowed for players and mentors to form memorable relationships. Player-Mentor: Players “loved” their mentors. Nearly every player interviewed “loved” their mentors and discussed at length how helpful and fun they were. I love my mentors. They're not like teachers … but they're somebody you can look up to and ask questions. They're cool, they're understanding, and like even though we have our group discussions, they always put their input in so we can have a different point of view of everything. That's like pretty awesome. Kate and John*, those are probably the two coolest people that I will ever meet. Because John is so smart with video games and technology and stuff, he knows how to do all kind of computer networks and all kinds of programs and stuff. And Kate, she mentioned that she was an English major, and I want to say she's going to Panama for teaching. And it's like, I feel that she would be a really good teacher. She basically a teacher right now, because she's taught me things throughout this camp and I feel that that was really useful. So yeah, Kate and John are pretty cool people…Yes, because Kate is like that person that's always going to say, "Get pumped, let's do this." And John is like that real smart guy, and he will always help us when we have problems and stuff during the games. He would always just give us good advice. Because the mentors can't play the game for us, but they can help us and guide us while we're playing it. And they did a very good job, both of them. *Kate and John are a pseudonyms for the player’s mentors. Players noted that they felt very connected with their mentors because they were close in age. I really liked my two mentors. I feel like we really bonded with them. I think other people in our group did too because they were young and they were easy to talk to, someone that you'd want to talk to after this program is over. Like now, I feel like I really want to keep in touch with them. In addition to bonding with their mentors, players also appreciated observing how their mentors approached and solved problems. I think they were really helpful. It's interesting to see, some games they're learning along with us and they don't just know everything too. So that's interesting to see how they deal with it, since they're older, I guess. It's interesting to compare yourself to how they work their brain, I guess. While the relatively young age of the mentors contributed to feelings of closeness to their mentors, the thoughtful actions and consideration of the mentors led to the strong connections between players and mentors. My mentors were more like a brother-sister kind of relationship with us. They would talk to us. If they saw we were feeling a little sad, they would share information with us. If we were having a bad day or if they were really happy – someone's birthday, our mentor brought cupcakes for her, and it was just so sweet. It was like she really cared about us. She's not just here because she has to or because she wants volunteering hours. It felt like she really cared about us, and I liked that. Mentors also encouraged players to participate in activities outside of their comfort zone. I think the mentors are cool because they encourage us to think and guess, and it's not to where it's awkward, and you don't feel bad about getting it wrong. If you get it wrong, it's okay, try another way. A common sentiment among players is how their mentors “made” the program. There's been sometimes where I needed more understanding of things, but it's always been like a positive outcome because I have such good mentors. I'm not trying to keep going back to them, but they're the reason why this place is running, because we have such good mentors here. They're really helping us. Mentor-Player: Mentors felt connected to the players, however some needed support managing behavior. Mentors felt connected to their players and appreciate the opportunity to support and mentor their players. Coming in and getting to know these kids was really interesting, and I really enjoyed that part of the job. I liked being there for them, because I felt like everybody does – if you think back to how you perceived the world when you were in high school, you've got such a tiny perception of what the world actually contains, and I liked being there during the discussions, when we'd just be talking, and we'd be talking about things going on in their lives, we were talking about the music, the movies that were coming out soon that they were looking forward to, and we'd get to talking about other things, and then you'd have an opportunity to bring in something you learned from college or something you've learned from somebody you [knew] in college, or something from a place you've been that isn't Chicago, and I really felt like I was kind of expanding things for them. Not that I was such an amazing educational source for them, but it was nice for them to have somebody who wasn't like them, but was willing to talk to them. I felt like it was definitely an older brother role. I had a lot of fun. I really enjoyed the whole program. I loved who I was working with. My team was awesome. I had a lot of fun. I thought it was really good. Although most mentors developed positive relationships with players, some noted they experienced challenges in their ability to manage and supportively interact with players. This was particularly the case with mentors who did not have experience with youth prior to their participation in The Source . It was an experience. So I learned a lot. It depends on the players. There was a sense, when I first started working, in combination with my mentoring partner and the rest of the players, I felt like I had to assert myself and kind of like being in a wolf pack. They were pretty good overall. It took a lot of managing. My other mentor in particular was used to being with hands-on people and running around, managing other people at the same time, so I kind of just tried to take notes. Player-Player: Players “loved” their groups and made strong friendships. Although players varied in how quickly they felt comfortable with their groups, all players interviewed concluded the program with positive associations and strong friendships with fellow team members. I love my group, I remember the first day, they were all antisocial, doing their own thing, always on their phones. Now, we all have each other's numbers, we're always texting each other, always talking together outside The Source . We even made plans for the Saturday, just to see each other before school starts and stuff like that. It's nice, and it's definitely making me make new friends that I wouldn't normally make friends, because they're from the South Side, and I’m from the Upper North Side, and I don't usually go down there. So it's nice, they're sweet and they're funny. [ The Source ] was fun, I guess. It was something different, a change. It’s been fun. I like my group. We got really close really quick, so we're all friends. I don't know; it's weird. We just kind of clicked the first few days. We kind of had like the family kind of. We were so close, so we like to work together and play harder together. Some players noted that participation in the program impacted how they interact with others. I used to be shy to talk to people, but now I'm not that shy anymore. Players appreciated how teams were composed of players from various grade levels. It's nice cause not all of us are in the same grade, we meet older people, people that's kind of in the same grade as you. Like, getting to know like more, more like other players from different schools. Also like, being around like college students as well or graduate players is also fun. You also get to participate in teamwork with those different players. One player noted that working in their teams made the activities more fun. It's interesting, I mean, we get along, we work together to try to solve certain activities, and it's just, I guess, working with our group, just kind of made it a lot more fun. Mentor-Mentor: Most mentors had a positive relationship with their co-mentor, and all mentors appreciated having a co-mentor. Most mentors felt as though they were perfectly matched with their co-mentor. I worked with Kate*. Kate was awesome; she's – it was actually an interesting dynamic, because I was more like running the games, keeping them paying attention and making sure the games were being done, while she was more doing the general conversation type stuff, keeping them talking, keeping them paying attention, so it was an awesome dynamic. The other mentors, there wasn't too much across group interaction. I knew a couple of the other mentors; some of them were from my school. Most of them were awesome; I don't think I had any problems with the other mentors. *Kate is a pseudonym for another mentor. That was great, because we got along very well. She played good cop very well, and we watched each other's backs and between us we covered all the bases pretty well. And we made a good team. It was fun and that's it, it worked really well. And there was no way that anybody could have done that solo. The original plan was one person per ten, and on paper it sounds okay, but after going through it, two mentors was definitely – I was really, really, really glad that that happened. There is evidence that some mentors did not balance the player engagement and behavior management tasks well with other mentors. I think I kind of ended up with someone I balanced out with. I heard there were a couple of mentors that didn't really like the person they were working with, especially – my team shared a room with another team. Their dynamic was much different. One of their mentors didn't talk much, didn't manage much, so it was kind of all down to the other mentor to manage everything, which ended up being a bit too much for him. His group was a bit more unruly and louder and he had a hard time keeping control of them. I think I got kind of lucky, I got paired with a mentor who [unintelligible] me really well. Some of the other groups, not so much. Mentors-Game Designers: Although mentors expressed needing more support with how to play the games, mentors generally felt supported by the Game Design Team. Most mentors felt supported by the game designers. I felt like I had a good relationship with them, whenever I needed help, I could come downstairs and they’d explain it to me and I’d explain it to the players. They were super supportive, and whenever we needed anything, all we had to do was walk into the lobby, and if we had a question it got answered and if we had a problem it got fixed. So everything that I was doing with them worked out really, really well, but I don't feel like I worked with them that much on most things. I thought the game design team was phenomenal and the game design, I think they could have used some help as far as the behavioral aspects of the entire Ci3 program. I thought they could have used some assistance with that. But as far as the game design, I thought it was nothing short of phenomenal. I'm really – and Patrick and I talked from time to time about that – I'm really impressed. And I'm not easily impressed. I was really impressed with the game design, I was. Some mentors recommended that the designer of the day’s games or activities be on sight to help mentors adapt the activities if necessary and address issues that might arise. I went to Ashland and I was like, “Hey, this is our issue, we don't know what to do about it,” and the problem was that the other game designers that were, I guess, actually creating the games, weren't there, and they were off creating games for later in the program, and that was an issue because we would have to talk to her and then she would have to call them, and then they would have to call back and she'd have to relay the information to us. So by the time we got the information, it didn't matter. We'd improvised something else to do. So maybe having the game designers that created the games, for each day, whoever was in charge of creating that game, walk around to the different rooms and check in on people, and let us know – be aware of who was in charge of this game for this day. That would have been really nice to have somebody to be able to be like hey, in case you're having any issues, come to me, I can come to your room and talk it out with your kids. That would have been really useful.